1. 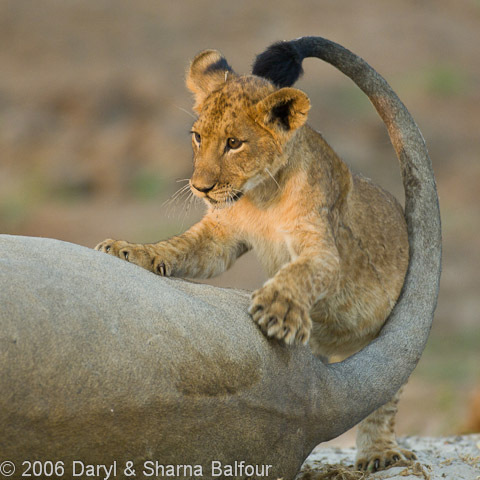 Daryl, how did you get into wildlife photography? In 1986 at the instigation of my wife Sharna I gave up a successful public relations and marketing business I'd started after 13 years in newspaper journalism, and moved to Botswana to "turn dreams into memories." 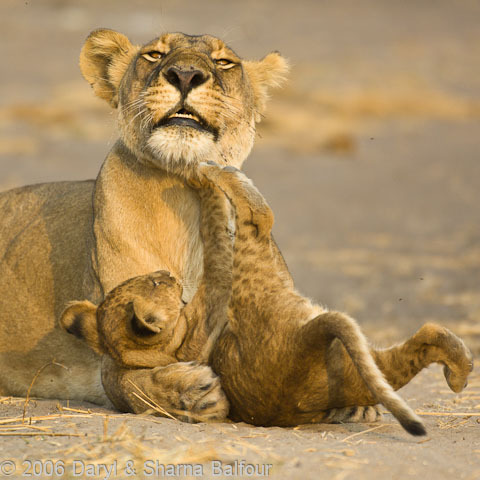 We ended up managing a safari camp for a few years, during which time I put my cameras and journalistic abilities to use recording the wildlife around us. 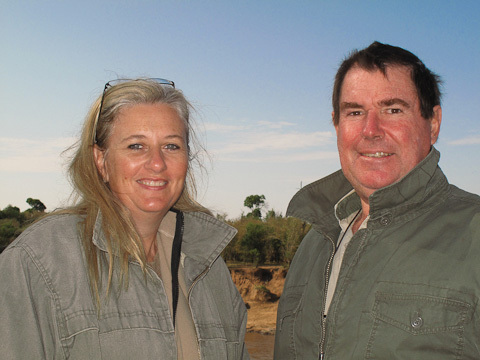 In 1989 we decided to leave the safari industry and moved to Zululand to start work on a book on rhinos, which were suffering badly through poaching. We spent a year in Umfolozi & Hluhluwe game reserves working on that book, and we've been living our dreams ever since. 2. In your book 'African Elephants, a Celebration of Majesty', you describe how both you, and your Nikon camera, survived being trampled by Tshokwane, one of the Kruger Park's famous 'Big-Tuskers'. Please tell our visitors about that day. Are there any lessons from this event? The entire tale is a story in itself and too long for this interview but it can be read in the book. Briefly, I'd approached the elephant on foot about 1-2 kilometers off the road (which we had special permission to do in Kruger) and started taking my shots. Tshokwane made a series of mock charges, which I photographed. I then "shoo-ed" him off and turned and walked away. Tshokwane retreated some way then went back to feeding. After I'd gone about 100m I looked back and preferred the light and the setting, so decided to return for a few more images. I walked to within about 40m of Tshokwane and noticed that he was aware of me but continued feeding. 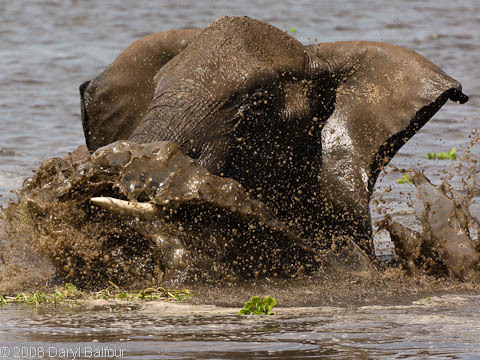 This was the kind of behavior I'd become accustomed to with the other big old tuskers I'd worked around. I set my tripod down low and sat on the ground to commence shooting. Suddenly Tshokwane charged. At about 15m from me Tshokwane stopped his charge, then curled his trunk under his chest, trumpeted shrilly, lowered his head and charged in all earnestness. I continued photographing, saying to myself "This is for real! Great shots!!! I continued photographing until my lenses would no longer focus - and by then Tshokwane was less than 3 meters from me, approaching in a cloud of dust and I knew I was in trouble! I scrambled to my feet and was hit in the small of my back as I turned to get out of the way. A moment later a second heavier blow sent me flying into the thorn scrub and before I knew it I was under Tshokwane's body and his feet were flying around me. Trying to get out of the way and avoid being stood upon I clinched like a boxer, grabbing hold of one of the elephant's forelegs and hanging on for dear life. I recall looking at the toenails on his feet and thinking how ugly they were! Tshokwane stilled, then stepped back and stood on my left calf muscle before reaching down with his trunk, grabbing my right ankle, and hoisting me overhead. He then slammed me back into the ground, dislocating my hip with the wrenching impact and thus immobilising me. 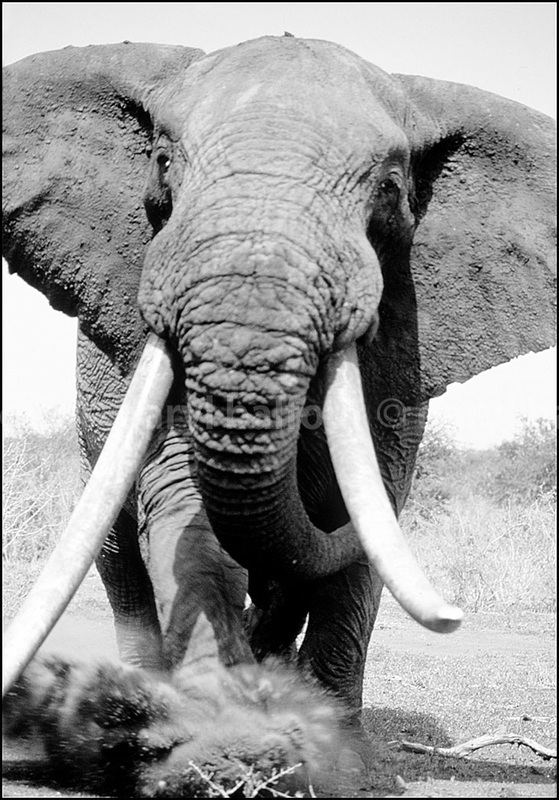 Then I saw one of his huge tusks coming straight for my face and I pulled aside, taking a glancing blow to the side of my head which fractured the skull and knocked me senseless. I regained consciousness about an hour and a half later and to cut a long story short, dragged myself to where I could see my revolver lying in the dirt - the Kruger authorities insisted I be armed when they gave us permission to walk in the park, and Tskokwane had torn a camera bag and my holster from a belt around my waist - and fired a distress signal of three shots in the air. Sharna was waiting in the vehicle back on the road, heard the shots, realised I was in trouble, and eventually found me where I lay in the bush. She managed to load me into the back of the pickup and drove me to Skukuza, from where I was airlifted to hospital in Nelspruit. Perhaps the biggest lesson from the event was that a mock charge can turn very serious in an instant. 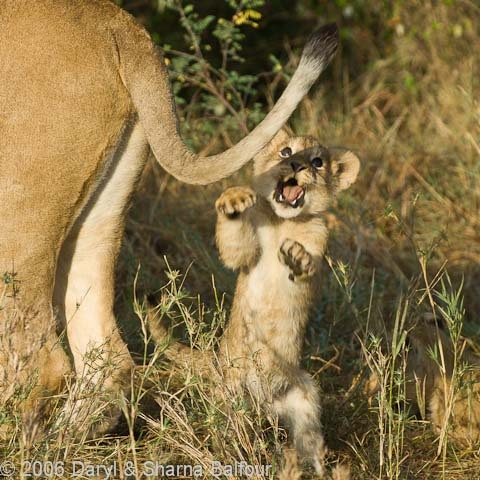 The only predictable thing about a wild animal is its unpredictability. Also the film was recovered unscathed from both the Nikon cameras I was carrying despite Tshokwane having stomped on them really well! That taught me about the durability of my equipment and I've sworn by Nikon cameras ever since. 3. Your book 'Etosha' inspired us to visit Etosha National Park in Namibia and we have been back numerous times. What advice do you have for a visitor in terms of finding and photographing animals - which waterholes are good to visit, how can visitors get the most out of their safari here? I've not been to Etosha for a number of years so it would be unfair to say where is best right now. I always enjoyed photographing at Kalkheuwel, Goas and Okondeka waterholes but we also had access to several private waterholes closed to the general public where we did a lot of our work. My best advice for visitors is to get out of camp really early and drive the roads in search of predators still on the prowl, then take a picnic and cooler box and sit through the heat of the day at one of the waterholes. Daily sightings logs in the rest camps will give a good idea of which waterholes are most active. Much of the best action in Etosha happens in the middle of the day...so polarizing filters are a good idea for photographers. 4. 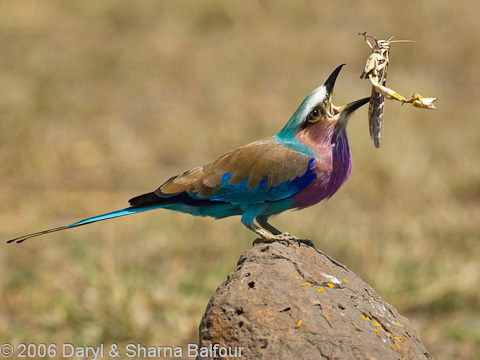 In addition to the waterholes are there any other good spots to photograph birds and animals in Etosha, maybe the smaller or rarer ones? I always had good photography walking around the koppie in Halali rest camp. Also along Fischer's Pan in the Namutoni area, especially after the rains. Ozonjuiti m'Bari north of Okaukuejo, was always a great spot for sand grouse between about 8 - 9 am each day. 5. The previously restricted west of Etosha Park is now accessible to the self-drive public with the opening of the new Dolomite camp in June 2011. Residents of Dolomite camp can explore this pristine part of Etosha. Daryl, you had permission to travel through the west of the park when you published you excellent book 'Etosha' - what can you tell us about this part of Etosha that you call the 'wild west'? This western Etosha area is raw and rugged with burnt-red rocks and dark dolomite kopjes cutting through the silvery savanna. We love this western part of Etosha as you find baboons, sable and roan antelope plus Hartmann's mountain zebras, which are not seen in the east of the park. This far western section of the park is physically and spiritually different from anything else Etosha has to offer. Travelling west from Okaukuejo along the dusty track known as the 19th parallel you reach Ozonjuiti m'Bari, which is the furtherest visitors can go, unless you are staying at Dolomite camp in which case you can now proceed along the 19th parallel for about 130 kilometers, past about nine waterholes, until you reach Dolomite camp. You will notice the change from featureless mopani woodland to rolling hills starting to rise from the landscape, gently at first until quite suddenly the craggy dolomite hills appear in front of you. The road curves up and through a narrow poort where you enter another world! From the top of the ridge the land falls away across miles of grassland punctuated by dense stands of mopani, stunted boscias and towering combretums while in the distance purple hills march across the landscape. We spent a lot of our time at Otjovasandu, which is a waterhole located 40 kilometers south of Dolomite camp and means 'place of the young men' in Herero - this is a place to rejuvenate the soul and where the animals are wild and wary! 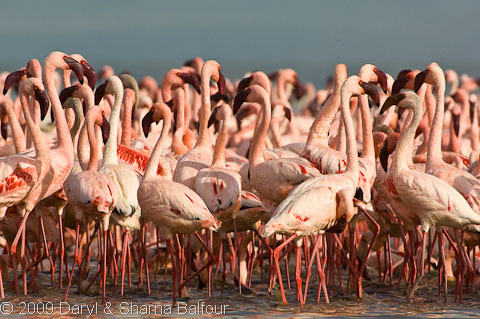 The Otjovasandu spring yields some of the sweetest water in Etosha and attracts many animals. 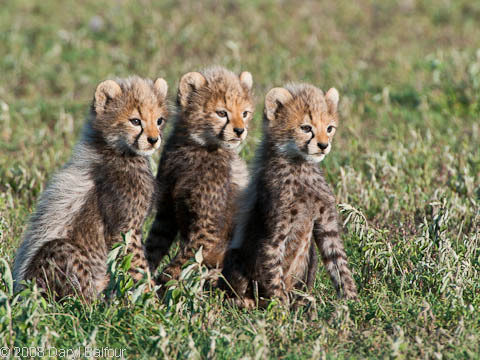 In addition to the rarer animals you also get to see black rhino, plus the exciting predators of lions, leopards, and cheetahs in this western part. 6. 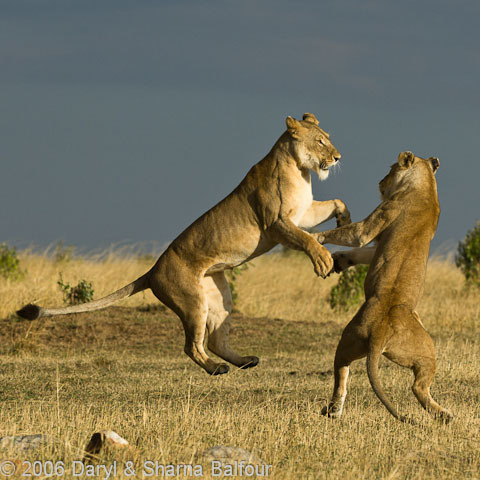 You seem to currently enjoy East Africa for wildlife photography, why the change of focus from Southern African National Parks? 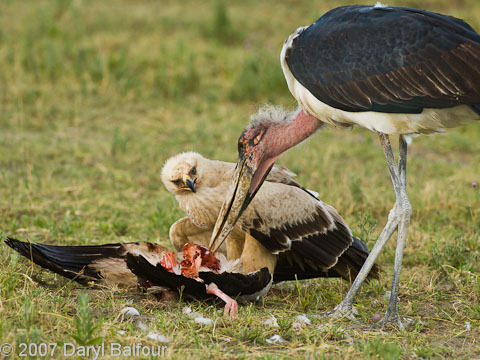 I find the East African parks far easier to work in as a professional photographer. The authorities there are far more accommodating and welcoming. I also enjoy the openness of the terrain, especially in places like the Maasai Mara and Amboseli. There is also a great diversity of wildlife and recently I managed to photograph the entire Big Five in one morning...lion, leopard, elephant, buffalo and black rhino. Don't let the South African reserves fool you that the white rhino is one of the Big Five...it is not! Add cheetah and a wildebeest migration river crossing to that lot and it was a pretty special morning! 7. How do you keep your photography different and exciting? I don't have to do anything to keep it like that...every day out in the wilderness is different and exciting, and I've been doing it for more than 20 years! 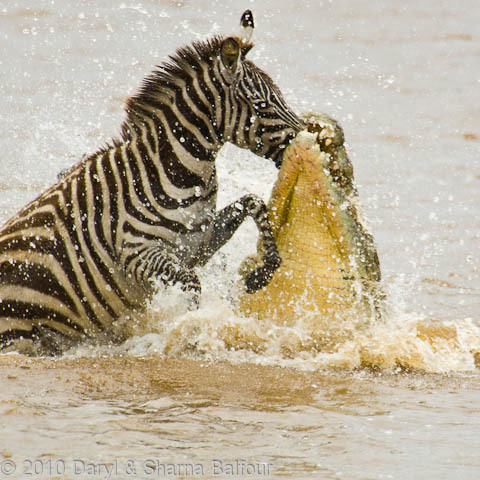 I run a variety of safaris throughout Southern and East Africa. 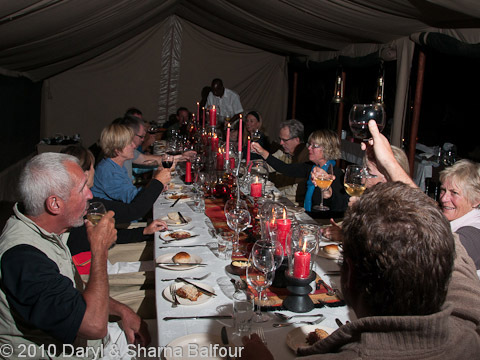 Some are private safaris for small groups of family or friends, while others are group trips. 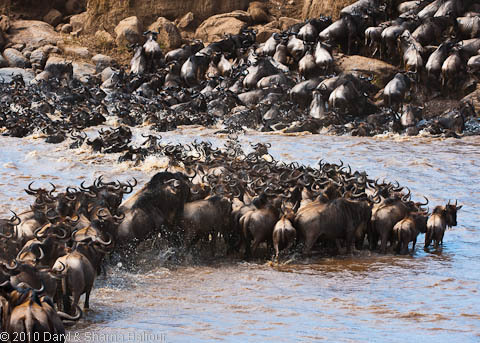 Perhaps the most popular trips I run are the Maasai Mara Wildebeest Migration safaris each year in August-September. 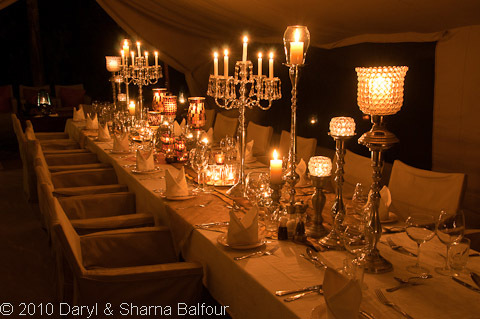 These are 7-night safaris in our private luxury tented camp which is erected on an exclusive camp site in the Mara specially for our use. We accommodate 12 guests and operate three customised Land Cruisers - never more than 4 guests to a vehicle (unlike the Kenya norm of 6 - 10). 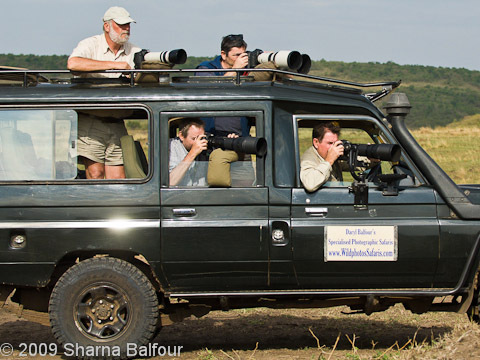 Sharna and I host the camp and guide in one of the vehicles while I have two of the top naturalists & guides in East Africa, Phil West and Pierre Burton, in the other two. after which we may have stories around the campfire or a slide presentation, or even tutoring in Lightroom and Photoshop or photographic technique. 9. 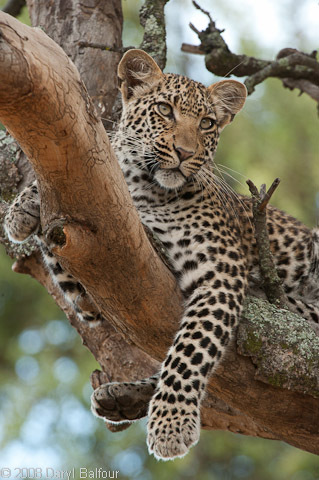 What Photo Safaris have you got coming up in 2011? We have these wildebeest migration trips of course, plus a Big Cat safari in the Maasai Mara in March which will run very much like the migration trips above. 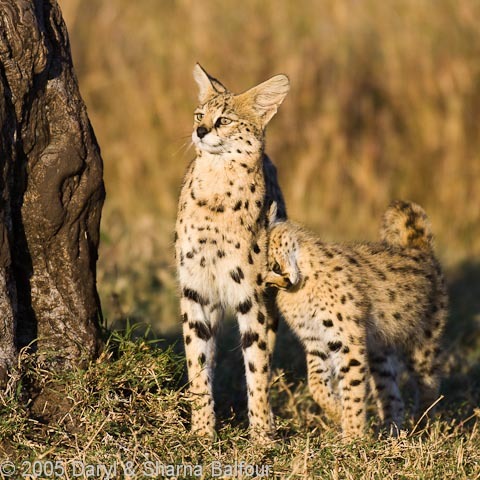 I also have a selection of other safaris in Tanzania, Botswana and Zambia - best to see our website Wildphotos Safaris for these. 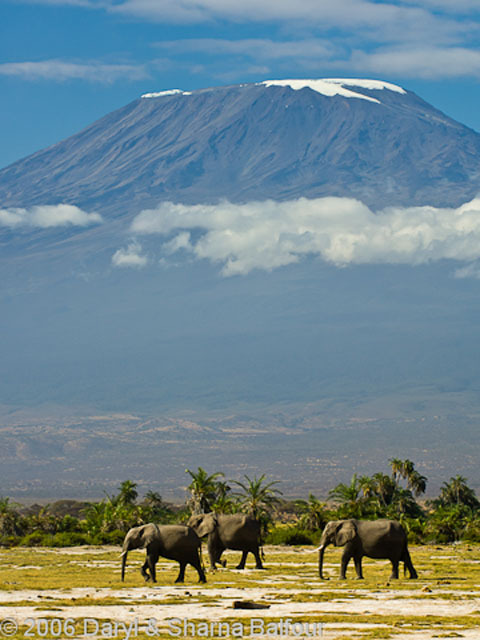 Of course we specialise in tailor-making safaris according to people's needs and desires. 10. You used to shoot with a Nikon 600mm f4 lens but now your primary lens is the Nikon 200-400 f4 VR, don't you miss your old 600mm!? I love the 200-400mm, especially on a DX-sensor camera like the Nikon D300 or D2X, which effectively makes it a 300-600mm f4 lens. I find the ability to zoom around my subject particularly useful in making my compositions. However, I recently took delivery of the latest Nikon 600mm f4 VR II lens which I use on the FX (full frame) Nikon D3S body and will be trying out the 24,4MP Nikon D3X shortly with this lens. 11. My wife loves your book 'Simply Safari'! 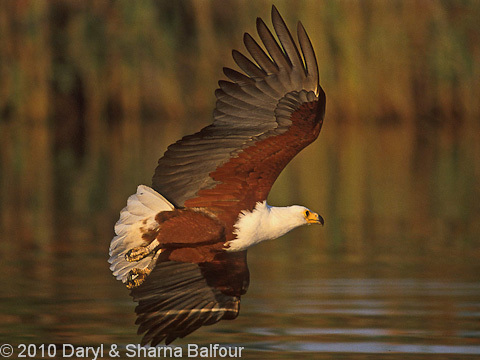 Why did you decide to photograph Southern African Game Lodges and which one most stood out for you? It was a force of necessity - we'd rolled our Land Rover in Mozambique and needed to find a project where we would not need to use our own vehicle. Photographing game lodge interiors was a solution - and a great challenge as we'd never done anything like it beforehand. And we were shooting film back then...so there was no way to assess our results until sometimes weeks later! Many of them stood out, but what disappointed us was how similar many of them were. There was a common tendency to use furniture from Bali, fabrics from West Africa...a lot of similarity from one lodge to another. I think Sausage Tree camp in the Lower Zambezi really stood out for me, and San Camp in Botswana. 12. 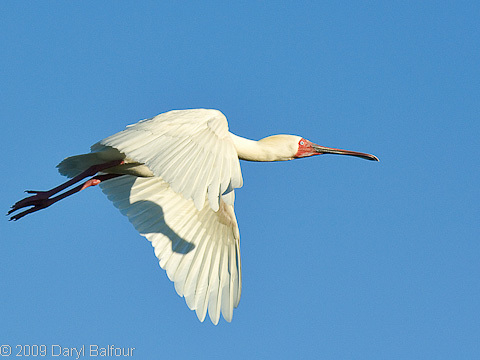 How much time do you spend on workflow - viewing and editing images? Do you use the standard photographer tools of Lightroom and Photoshop? Since I started using Lightroom my workflow has got much faster. I try to get my images right in camera so I have to spend as little time as possible behind a computer. I like to think I can edit an image in 5 minutes...it has to be something really special for me to want to spend more time than that one it. The agencies I'm with - Getty, Gamma, PhotoShot, Okapia, among others, require a minimum of post-processing anyway. I find digital photography far more time consuming than film used to be. I have an editing backlog of almost two years! Ha ha...is there anything new and fresh in modern photography? I try to teach my pupils that composition is all important - after all the camera can do just about everything else for you other than compose the shot - and that it is important to show animals within their environment. Perhaps the things I hammer home most of all is the importance of a camera support. Using some means of steadying the camera properly, be it a beanbag, tripod or window mount will make a huge difference to image sharpness even with a point and shoot camera! I also think it is imperative that photographers learn to use the digital histogram and highlights feature on modern digital cameras - perhaps the greatest advance in camera technology. There is no reason why one should not get perfect exposures once having learned to use these features properly. 14. Most nature photographers are married yet we never hear about their spouses. You and Sharna, however, have made a very good team - how did you get this right! I guess working together 24/7 can either make or break a relationship. Fortunately we've managed to make it work for over 20 years now. First of all let me say categorically that I firmly believe the future of tiger conservation probably lies in Africa and not in Asia. John Varty (of Londolozi acclaim) has established a tiger conservation project on a magnificent spread of land in the False Karoo in the Free State, about 2 hours from Bloemfontein. 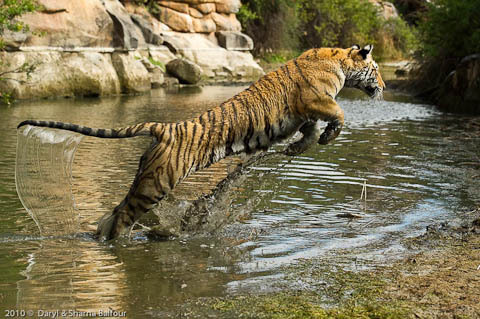 His tigers are self-sustaining, free-ranging and are breeding successfully. Sadly he recently experienced the first tiger poaching incidents in South Africa and I would not be surprised if there's a link to the rhino poaching syndicates currently in court. Many people might think that the Karoo is unlikely habitat for tigers and I did before visiting the first time. 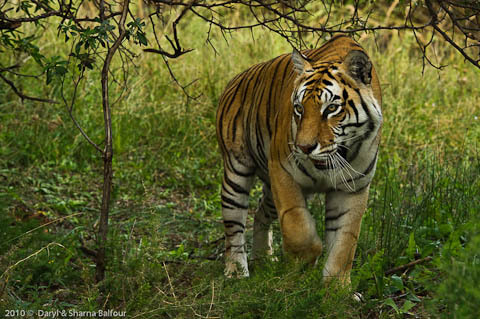 But Tiger Canyons, as it is called, has some spectacular gorges, canyons, waterways, reed beds and rocky hillsides. The tigers do not seem to care that they hunt blesbok, springbok, wildebeest and warthogs rather than chital deer, wild boar etc. 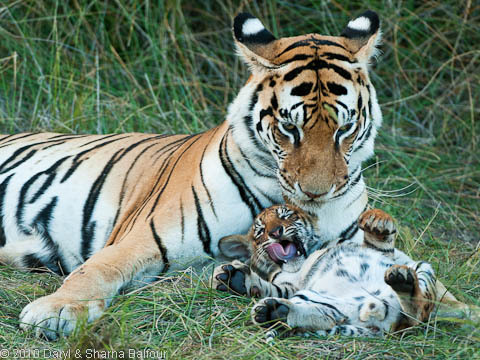 We are currently working on a few book projects with these tigers and I'm of the opinion that the addition of tigers in the wild to South Africa's other existing wildlife viewing options - great white sharks, whales, the Big Five - will become a major international tourist draw-card in the not too distant future. 16. Are there any animals or places that you have not yet photographed or visited that you would like to? Polar bears in the Arctic. We hope to do this at the end of 2011. 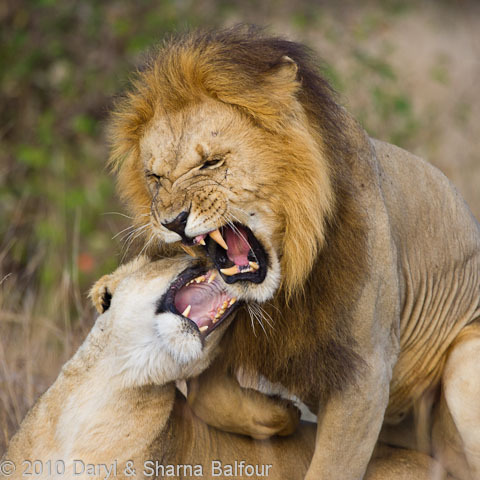 Daryl and his wife Sharna are acclaimed among Africa's leading wildlife photographers. 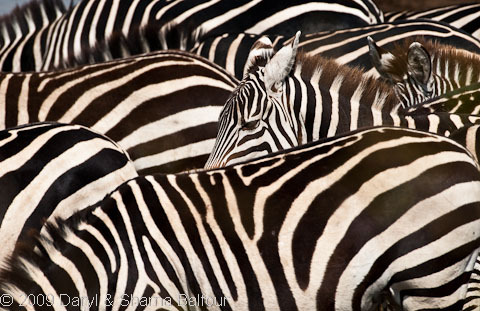 Their work is so highly regarded internationally they were invited lecturers at the prestigious North American Nature Photographers' Association (NANPA) annual summit. 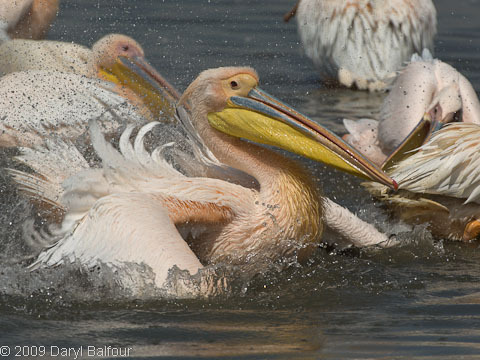 Daryl has published extensively including a book on photographic techniques, he is author of a photographic course available from WildLifeCampus and regularly publishes articles on photography in magazines. In addition, they currently have more than a dozen top selling coffee table books to their name, and are working on several more.